Sesame Chicken is my Picky-Picky husbands all time favorite. I'm glad, since it's very easy to make. It is sweetish, sticky-ish, quick and easy-ish......and makes an easy weeknight favorite. 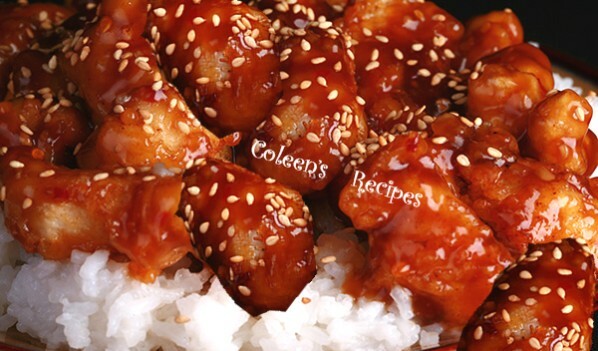 It is my opinion, that boneless-skinless chicken thighs make the BEST Sesame Chicken because they are super moist and flavorful (chicken breast tends to get a little dry). Picky-Picky hubby says he HATES chicken thighs (but he loves this recipe) so I just don't mention that it's made with thighs (snicker). Cut 6 boneless, skinless chicken thighs into 1" pieces (maybe a little bigger). Put them in a bowl that has about 1 cup of flour in it (no other seasonings). Take chicken pieces out of flour, shaking off excess. In another bowl, whisk an egg with a tablespoon of water and put the flour coated chicken pieces into the egg bowl, stir to coat....then back into the flour bowl. Toss to coat with flour (a second time) shaking off excess flour. In a fry pan (I use my electric skillet), brown the chicken pieces in a couple tablespoons vegetable oil (takes about 3 minutes or so per side). Drain them on paper towels. Mix well and bring to a gentle boil. Let it simmer (gently) for a couple of minutes, then add the fried chicken pieces, stirring to coat. Let the chicken simmer gently in the sauce until it thickens a little(takes just a very few minutes). Serve over hot buttered rice and sprinkle with toasted sesame seeds. To toast the sesame seeds, just put them in a DRY fry pan, over med-high heat for a minute or so, till light golden (stirring).